More complex and interdisciplinary design approaches support place based, interdisciplinary and innovative outcomes through an increased emphasis on the design process as a means for community engagement, capability and capacity building. In a world with increasingly complex problems, collaboration is essential. PARK+ was LandLAB’s winning entry into the Ponsonby Park design competition held in late 2017. This project pilots a new model for community led engagement, a design led process and interdisciplinary collaboration beyond a 'business as usual' consultation process. Ponsonby is a place of continuous transformation, re-inventing and re-discovering itself through its rich layers of natural, cultural and social history. Our aspiration is for 254 Ponsonby Road to contribute to this dynamic and on-going re-invention. 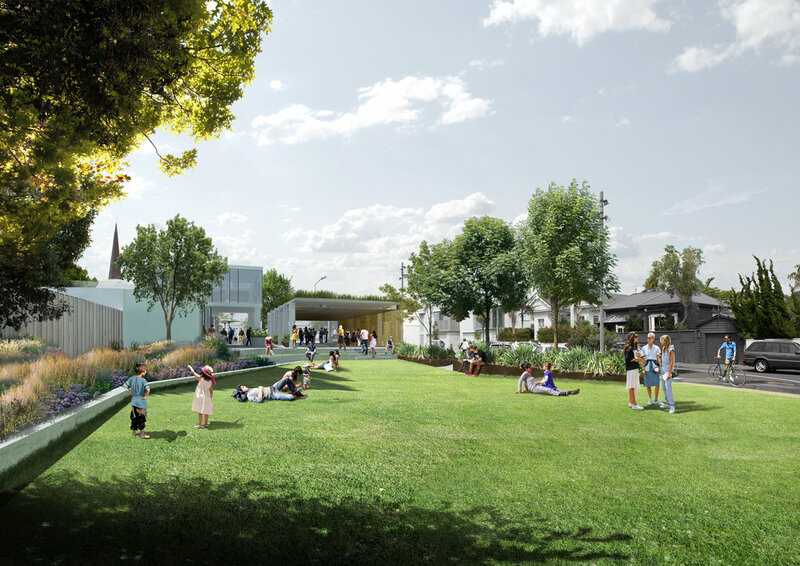 Ponsonby is inclusive, PARK+ will reflect contemporary values of democracy, inclusiveness and sustainability through a simple, but rich, sequence of interwoven internal and external public spaces. Ponsonby needs a dynamic new public space, not just a green one, that is strategically located and equipped to simultaneously compliment and counter-balance the street and to emerge over time via a choreographed program of intervention, occupation and event. Our vision is to sensitively and adaptively re-use 254 Ponsonby Road's existing structures and features to create a unique, hybrid open space and destination that captures the urbanity, spirit and sense of place of Ponsonby. PARK+ weaves together the street (urban) and park (green) to reprogram the site through the fluid interaction of open space, architecture, community and place. PARK+ embodies Ponsonby through innovative remediation, storm water filtration/re-use, sustainable energy generation, rich materiality, design excellence and creative place making that demonstrates best practice in environmental, cultural and social sustainability. Through the infrastructural layering of the site the, sometimes contradictory, performative, social and recreational requirements are able to be integrated into a hybrid urban park space. The combination of traditionally binary public and private activities enables a high performance landscape and the potential for a self funding governance model that enables a multitude of site occupations and activities and new definitions of park and publicness. As the project moves into its next design phases the shared design objectives provide a foundation for decision making, governance and further design exploration. A defining approach for Park+ is the idea that it will emerge over time via a choreographed program of intervention, occupation and event. This enables an ongoing relationship and dialogue with the community and the projects participants beyond completion of a built project through an ongoing system of adaptable and collaborative interactions.